That's right, there's SIX heads-up matches in tonight's $160 ChangeUp format. 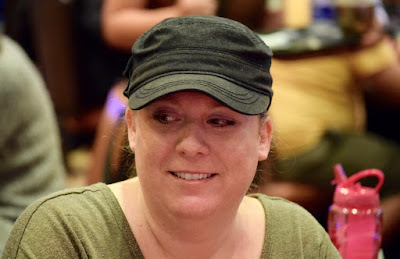 Carrie Diggs was talking with others at adjacent tables about how they are all looking forward to some extra heads-up play included in a hold'em tournament. Each of the four Shootout tables play down to a table winner, so there's four heads-up matches. Add two more heads-up matches in the Heads-Up finale of the event for 6 total.